President Dr. Ashish Vaidya is sworn in as NKU's sixth president by Kentucky Supreme Court Justice Michelle Keller. 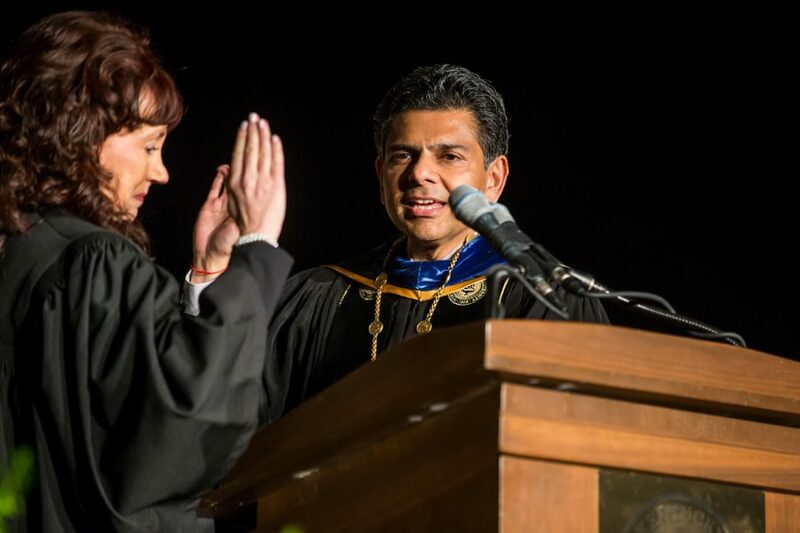 Family, friends, colleagues and students welcomed in the sixth president of Northern Kentucky University, Dr. Ashish Vaidya on Friday during his official installation. Vaidya assumed the role as president on July 1, 2018, but was formally recognized during the installation. Vaidya thanked everyone for coming to the event. He said his family flew in from all parts of the world, including his 81-year-old mother-in-law from India. He said his parents named him Ashish, which means blessing in Sanskrit. “I’m the one who’s truly blessed to have so many people in my life that love, support, encourage, mentor, challenge, inspire and yes—on occasion, even tolerate me,” he said while laughing and looking at his wife. Kentucky Governor Matt Bevin, in a video, said that in his experience working with Vaidya, he is grateful for his willingness to always step up and be a part of the solution when they are trying to solve a problem. He said he looks forward to continue working with Vaidya for many years to come. Keynote speaker Dr. Richard Rush spoke about his friendship, mentorship and work relationship with Vaidya. Rush is currently the president emeritus of California State University Channel Islands. “President Vaidya’s commitment to student success, taken collectively and respected—particularly in each student’s aspiration—demonstrates that human touch that he brings in support of those who seek to create a better life for themselves and for their families,” Rush said. Vaidya’s integrity and intelligence manifested in a vigorous passion for the mind—tied with a vision for this region’s future needs—established him as the right person to lead NKU, Rush said. Past NKU presidents Dr. Leon Boothe and Dr. James Votruba were in attendance, along with former interim president Gerry St. Amand who preceded Vaidya after fifth NKU President Geoffrey Mearns. Vaidya said NKU will be nationally recognized for being a student-ready regionally engaged university that empowers diverse learners to climb the ladder of economic and social mobility, Vaidya said. Vaidya said that educators must shift their focus from making students ready and their deficits to how they can create an educational environment. These environments need to meet students where they are, and eliminate barriers that hinder their success. Vaidya quoted Dr. Mildred Garcia, former president of California State University Fullerton in his speech. “If we believe in Dr. King’s dream, then we must also believe in equitable access to quality higher education for all students, regardless of where they are from, how they got here, who they love, what gender they identify with, how much money they have in their bank accounts or what god they pray to,” Vaidya said. Vaidya was sworn into office by Kentucky Supreme Court Justice Michelle Keller, after Lee Scheben and Andrá Ward, chair and vice chair of Board of Regents, respectively, presented him the president’s medallion.